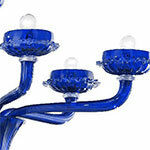 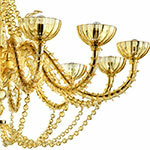 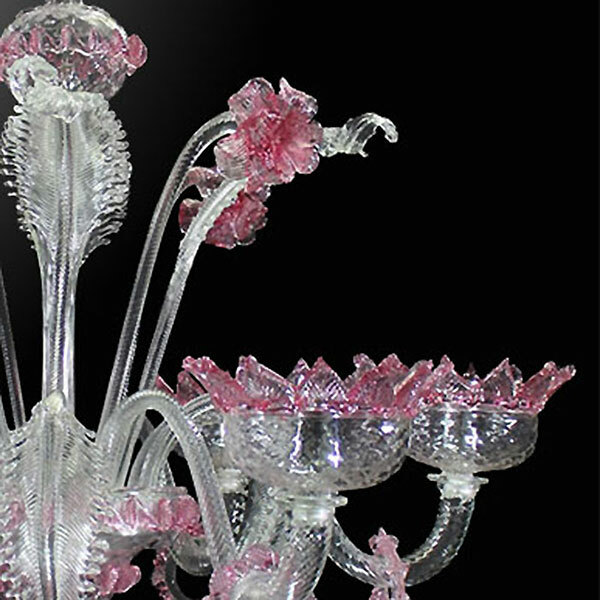 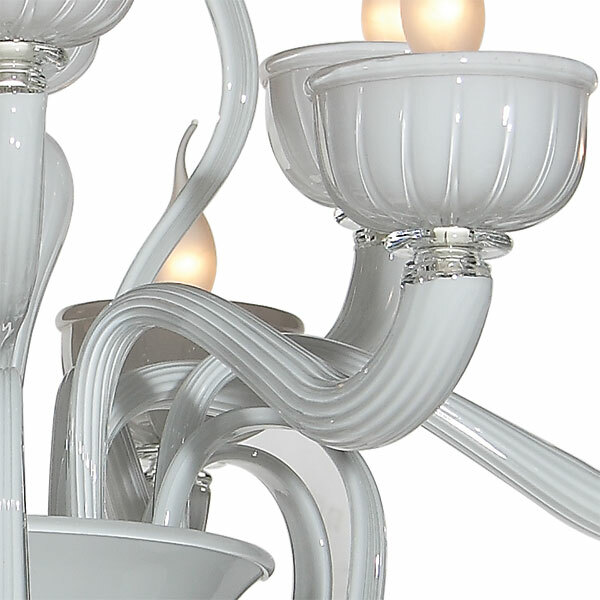 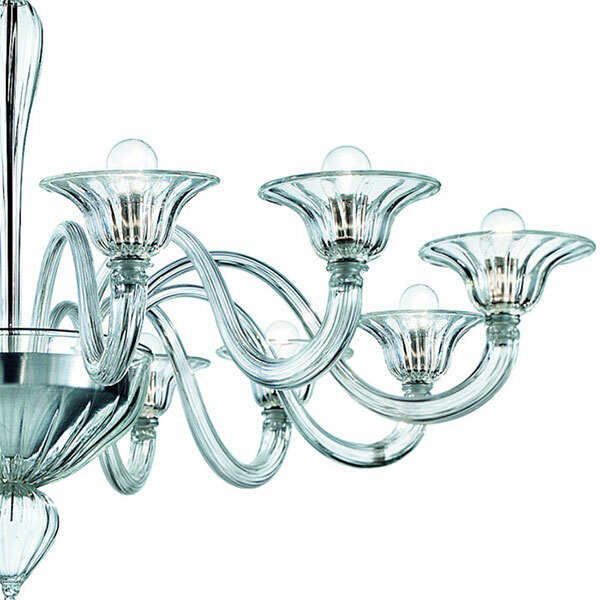 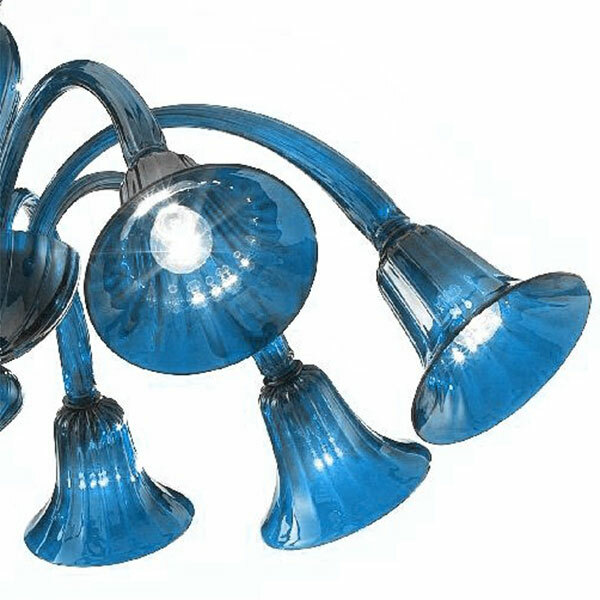 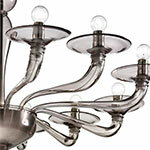 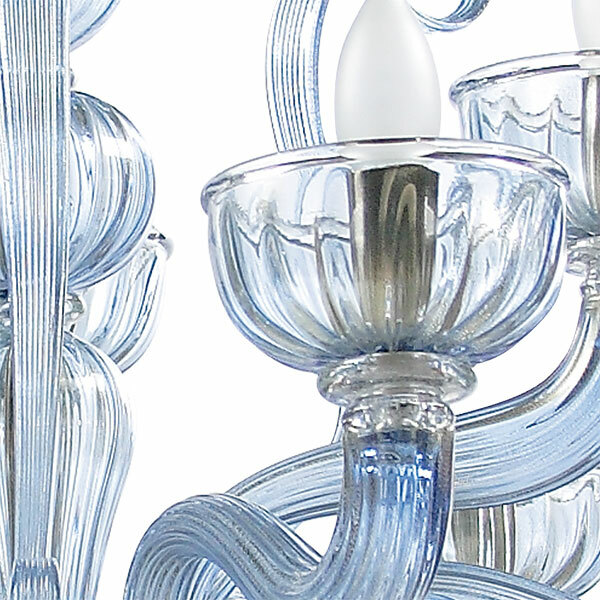 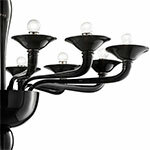 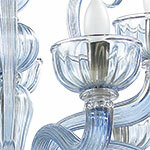 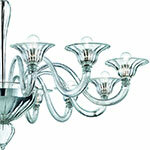 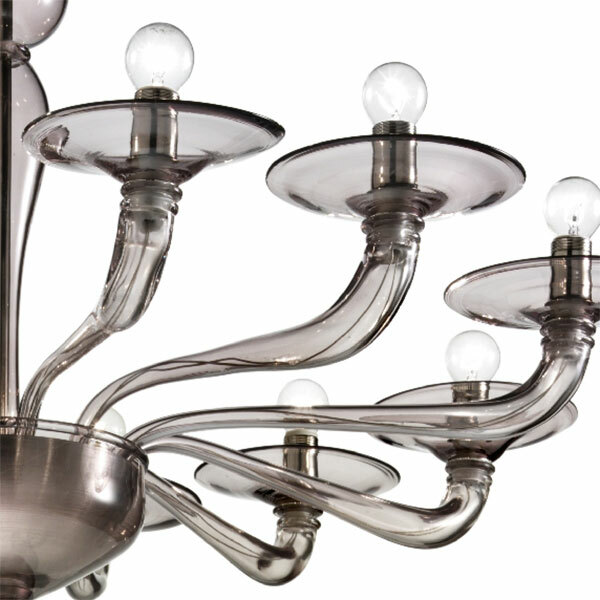 The glass of our items (chandeliers, lamps, vases, cups, glasses, mirrors, etc. 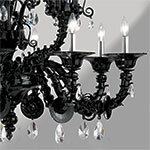 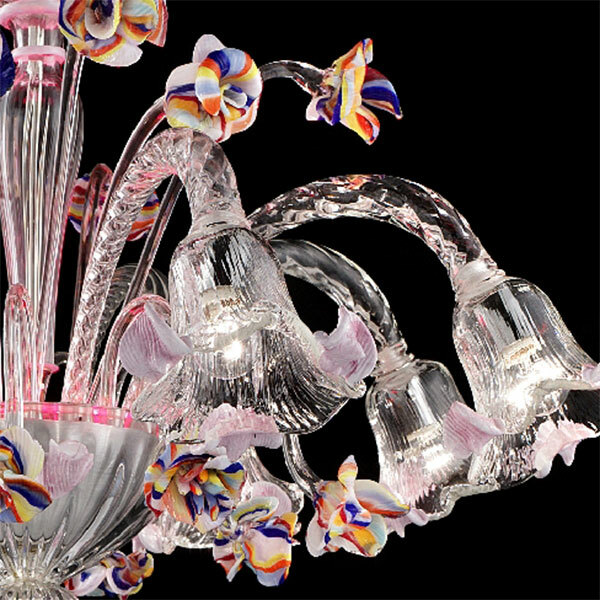 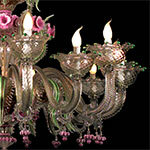 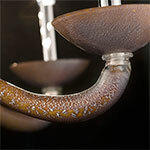 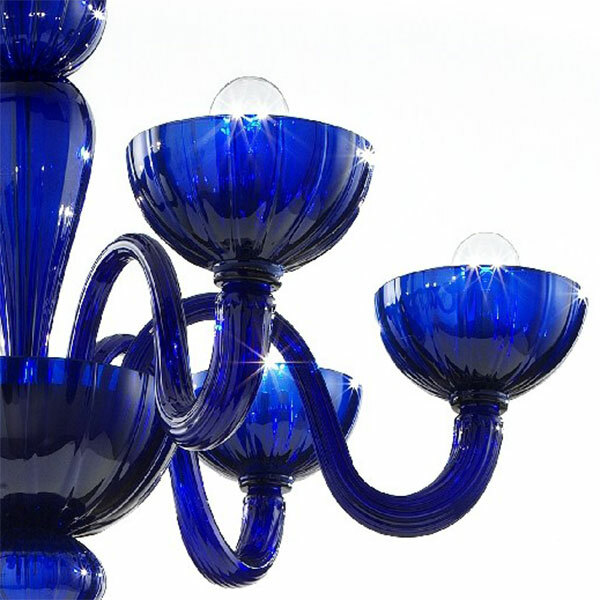 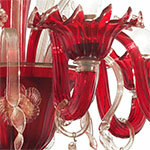 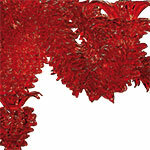 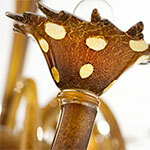 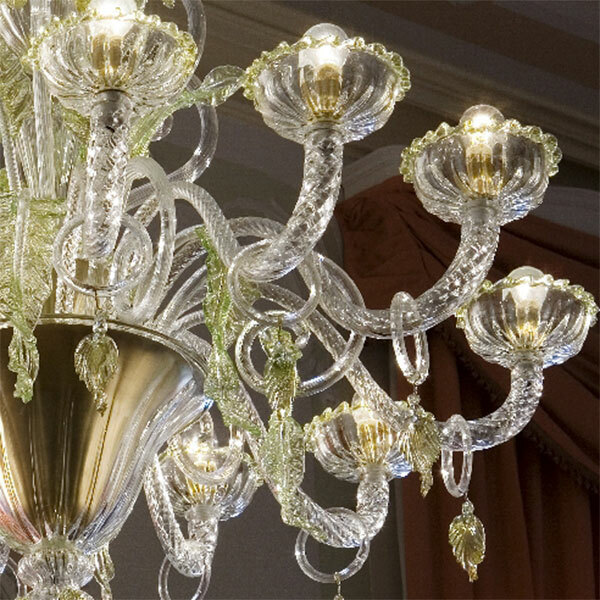 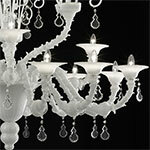 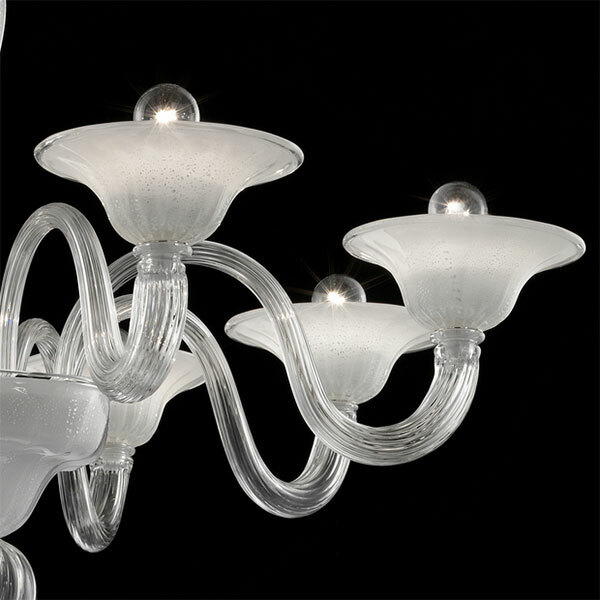 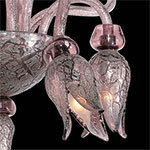 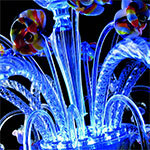 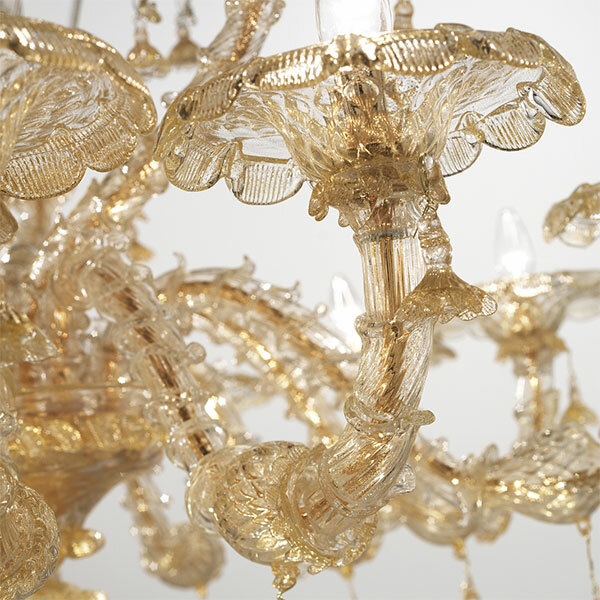 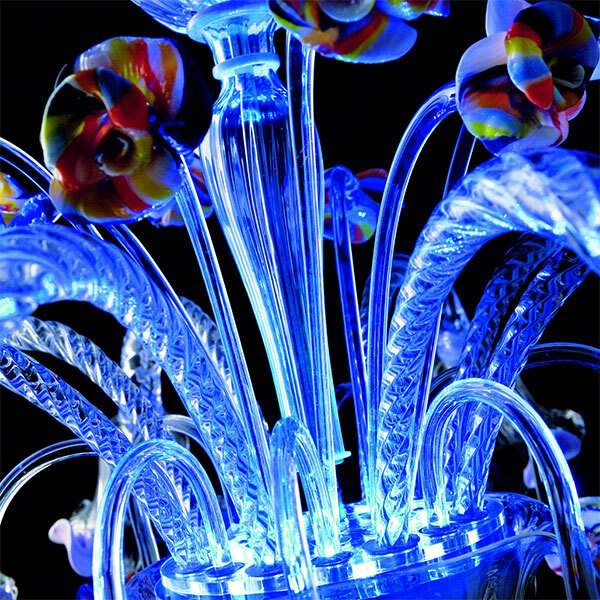 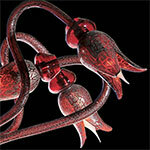 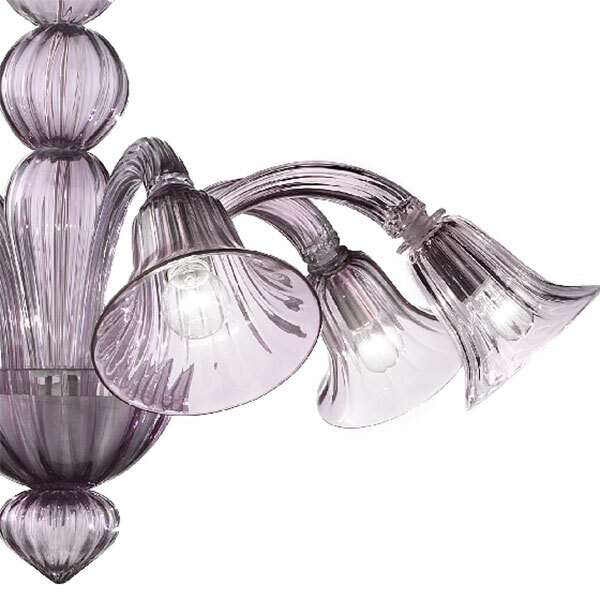 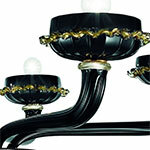 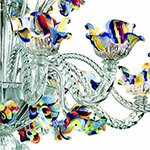 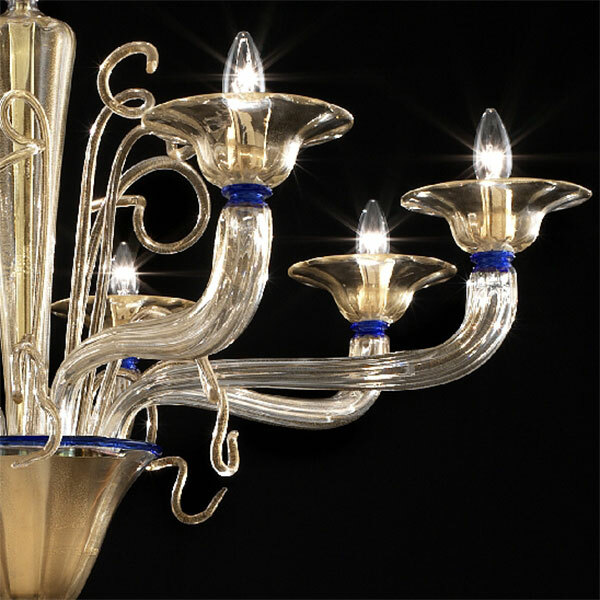 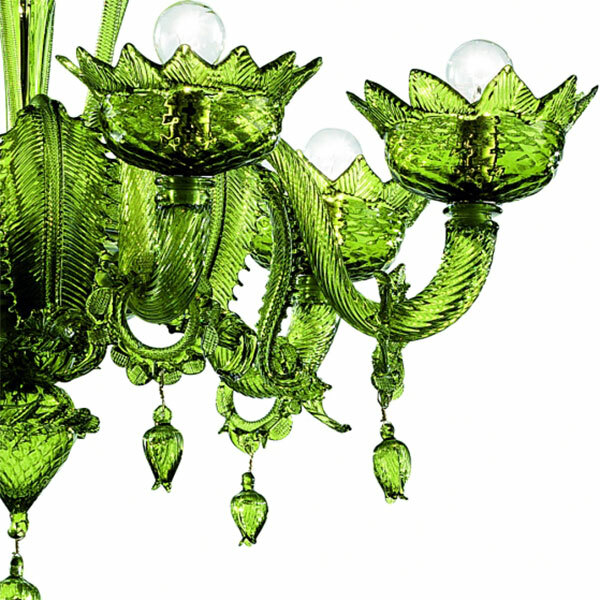 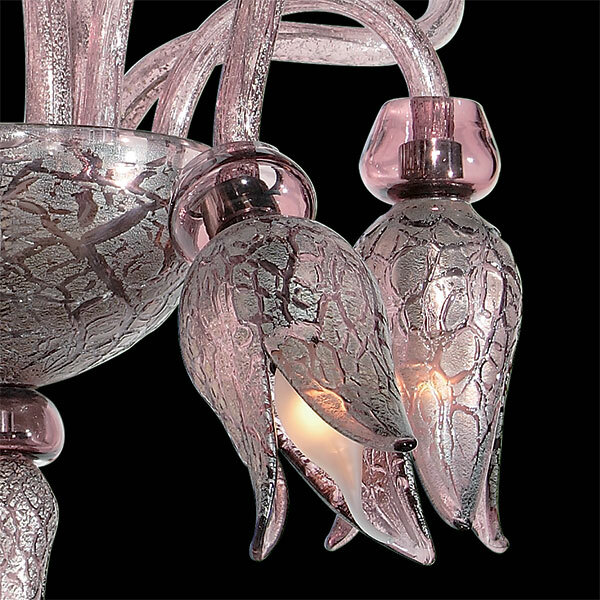 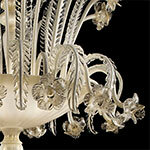 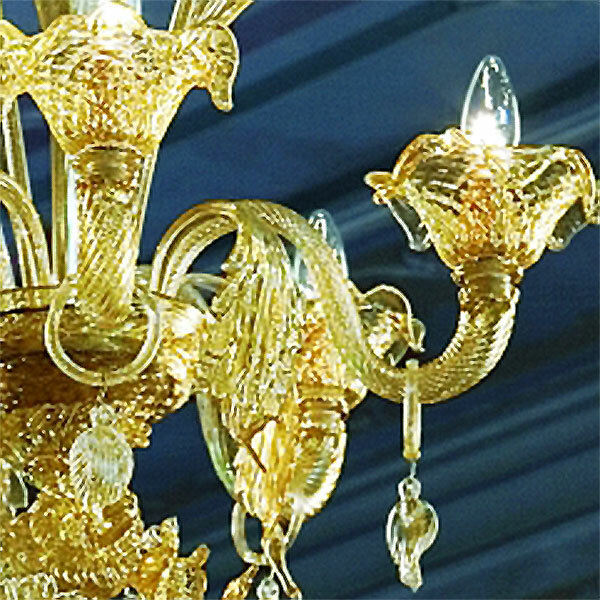 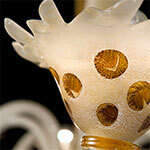 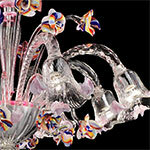 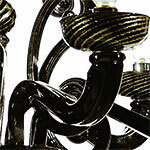 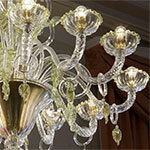 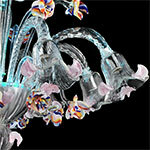 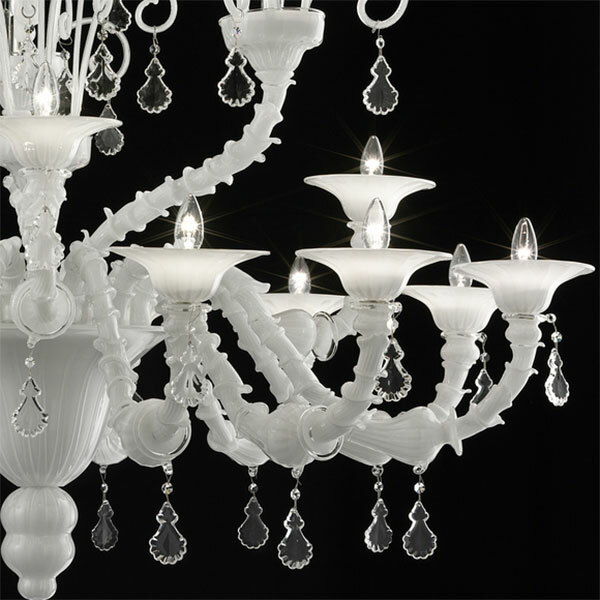 ...) is composed of the same materials used by Murano glass masters since the VIII century. 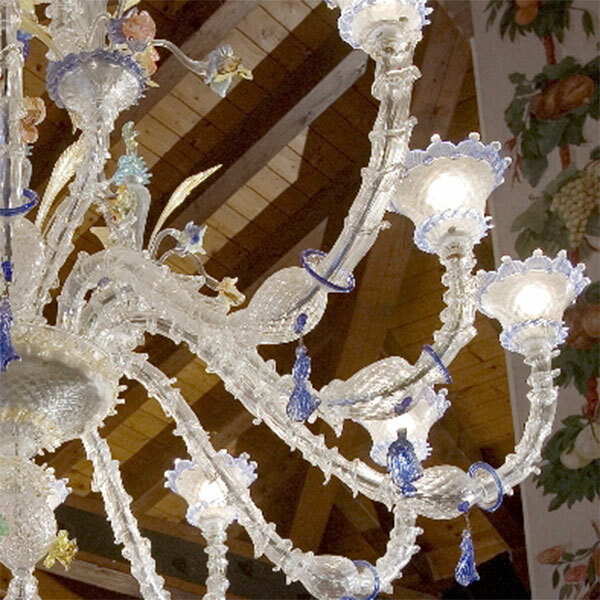 Also the technique and the tools used by our masters are the same with which the glass of Murano became famous and unique in the world. 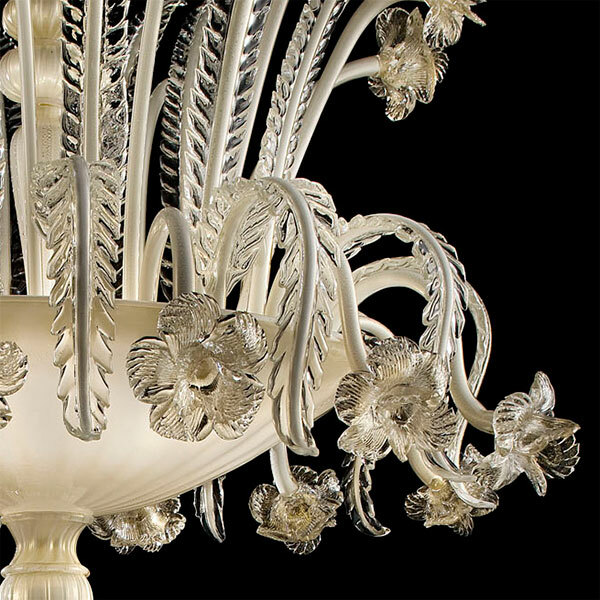 Its glass crystal clear glass, the enameled, with 24K gold dust or silver, milk white ( lattimo ), polychrome or colored pasta ( torseo ) are among the most known and appreciated. 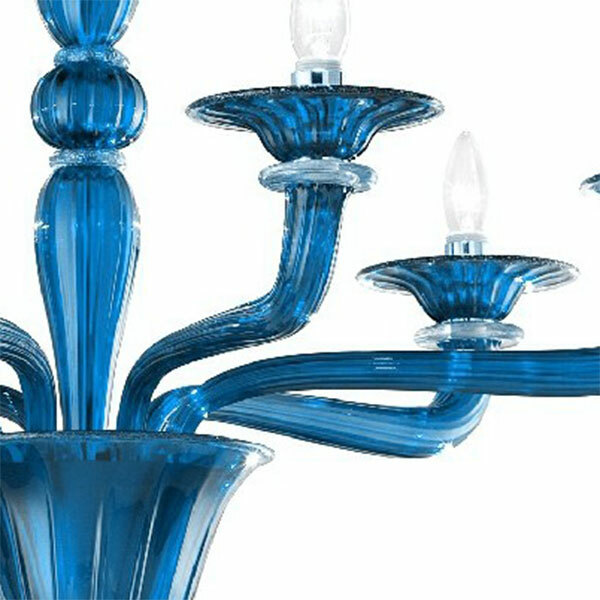 Below we present some of the glass used in our articles. 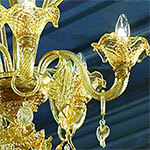 In addition to these lists we produce any color on request. 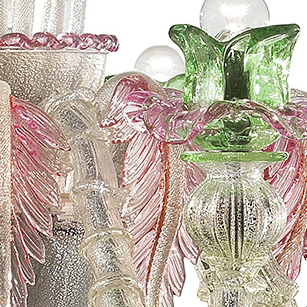 Transparent (crystal) with details in pink glass: leaves, flowers, pendants (if any) and "morise" (edges of the cups and the central body). 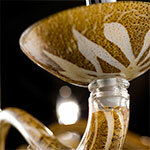 All glass with 24K gold dust. Transparent (crystal) with details in amber glass: leaves, flowers, pendants (if any) and "morise" (edges of the cups and the central body). White glass with silver dust and red spots. 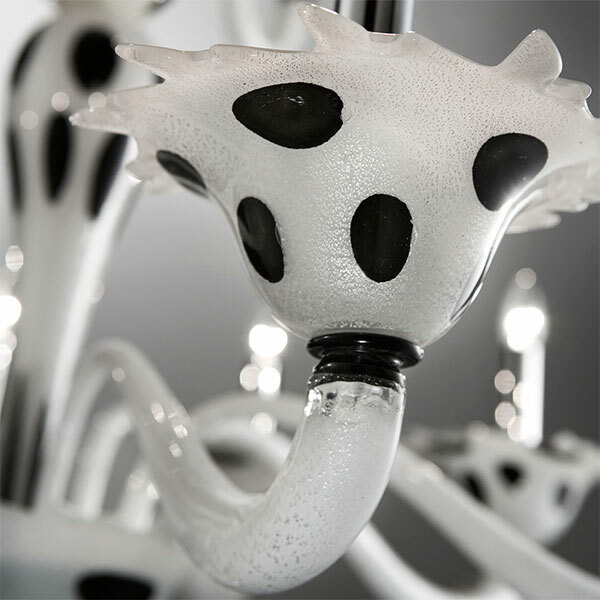 White glass with silver dust and black spots. Brown glass with silver dust and White spots. White glass with silver dust and Amber spots. 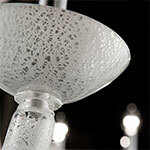 White glass with silver dust. 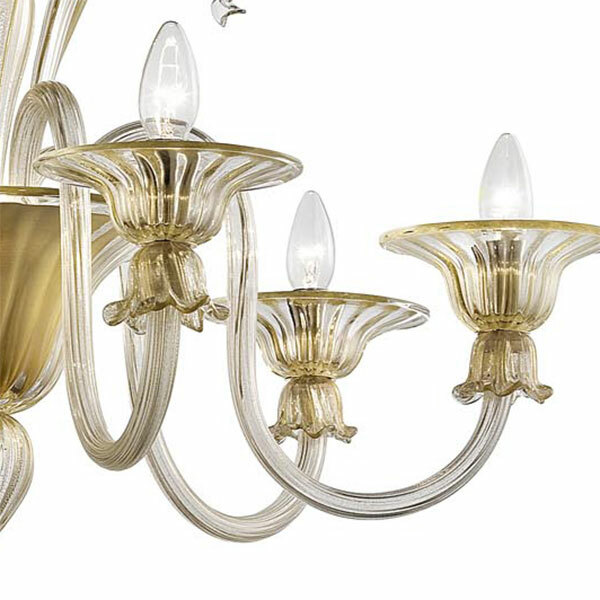 Beige glass with light brown designs. 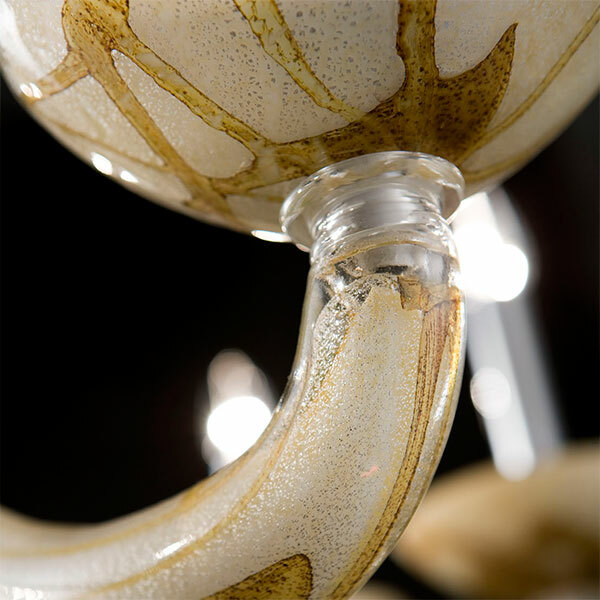 Brown glass with silver dust. 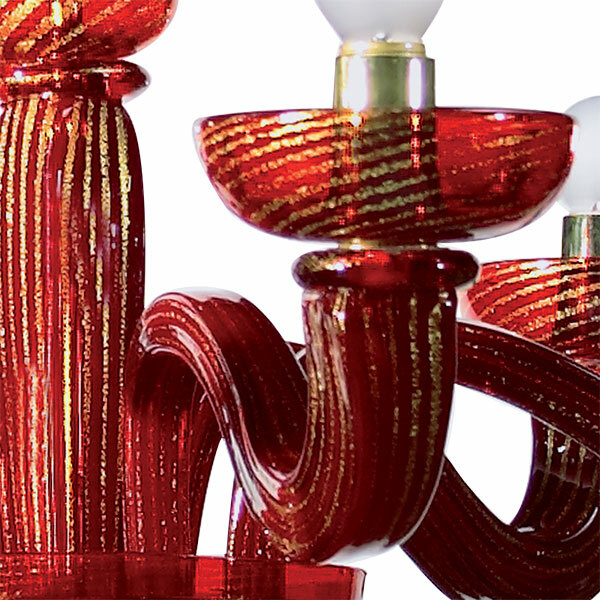 Glass Red/Yellow with details in 24K Gold dust: Leaves, flowers, pendants (if any) and "morise" (edges of the cups and the central body). Glass Black/Yellow with details in 24K gold dust: Leaves, flowers, pendants (if any) and "morise" (edges of the cups and the central body). 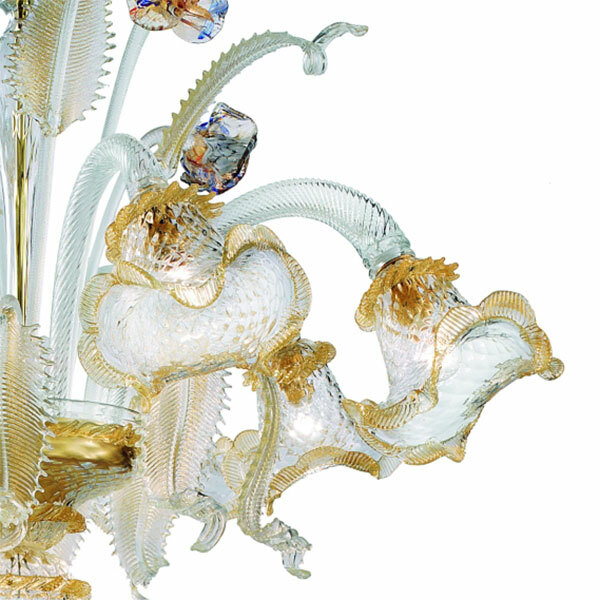 Transparent (crystal) with details in Blue sky glass: leaves, flowers, pendants (if any) and "morise" (edges of the cups and the central body). 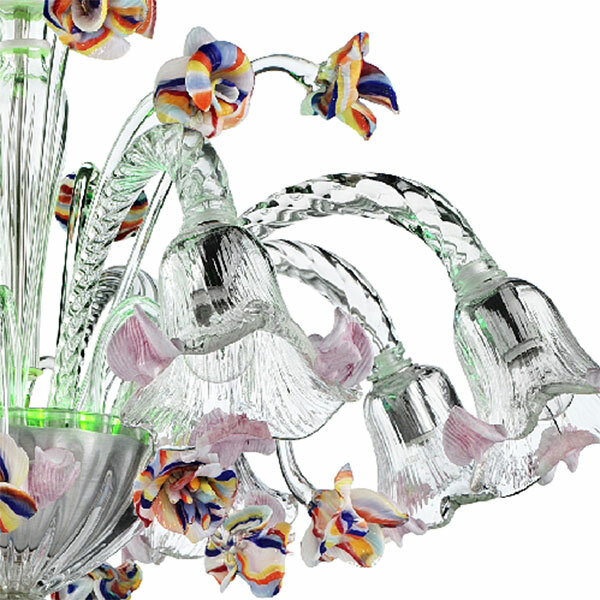 Milky white glass (lattimo) with details in transparent glass: leaves, flowers, pendants (if any) and "morise" (edges of the cups and the central body). 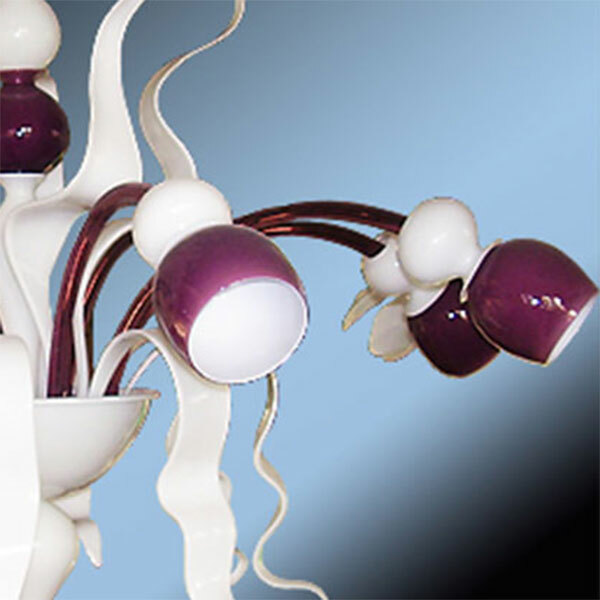 Purple glass processing with external plate of silver. Red glass processing with external plate of silver. 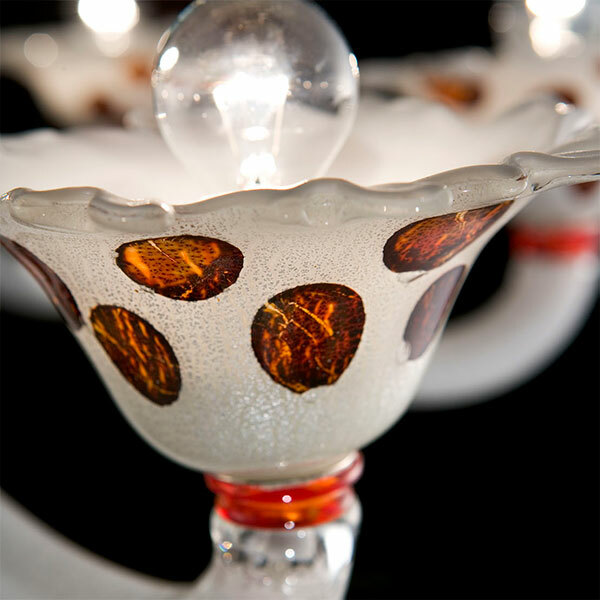 Amber glass with details in 24K gold dust: leaves, flowers, pendants (if any) and "morise" (edges of the cups and the central body). Black glass with details in 24K gold dust: leaves, flowers, pendants (if any) and "morise" (edges of the cups and the central body). Red glass with details in 24K gold dust: leaves, flowers, pendants (if any) and "morise" (edges of the cups and the central body). 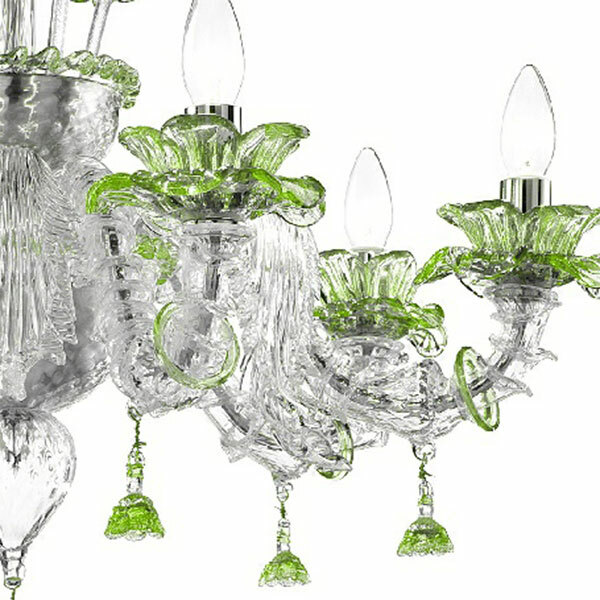 Transparent (crystal) with details in Green glass: leaves, flowers, pendants (if any) and "morise" (edges of the cups and the central body). Transparent (crystal) with details in Blue glass: leaves, flowers, pendants (if any) and "morise" (edges of the cups and the central body). 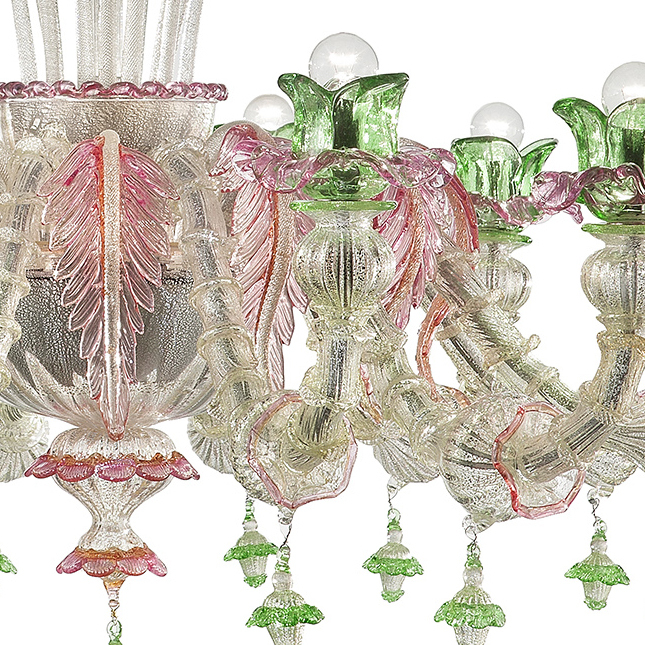 Transparent (crystal) with aquamarine glass details: leaves, flowers, pendants (if any) and "morise" (edges of the cups and the central body). 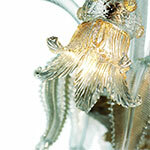 Transparent (crystal) with polychrome details and light blue leds. 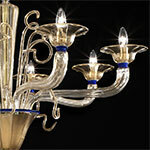 Transparent (crystal) with polychrome details and blue leds. 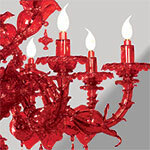 Transparent (crystal) with polychrome details and red leds. 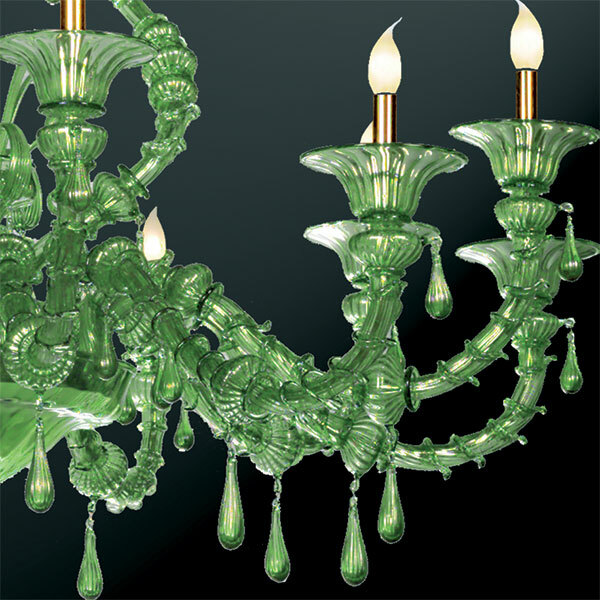 Transparent (crystal) with polychrome details and green leds. 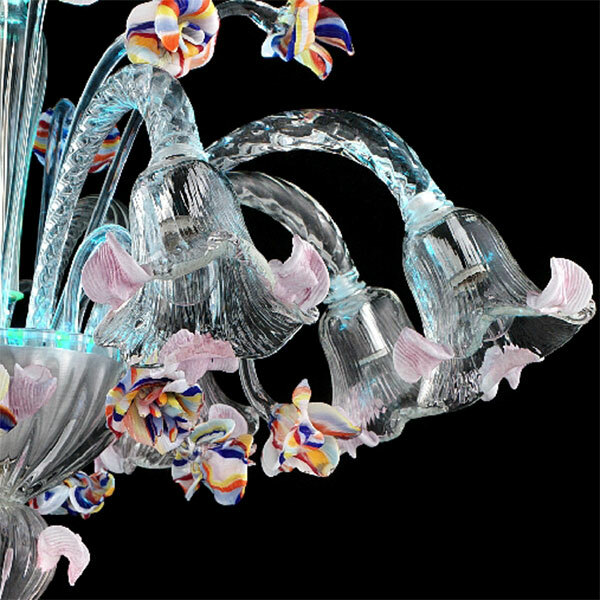 Transparent (crystal) with polychrome details. White glass with transparent details (crystal). White glass with details in 24K gold dust: leaves, flowers, pendants (if any) and "morise" (edges of the cups and the central body). 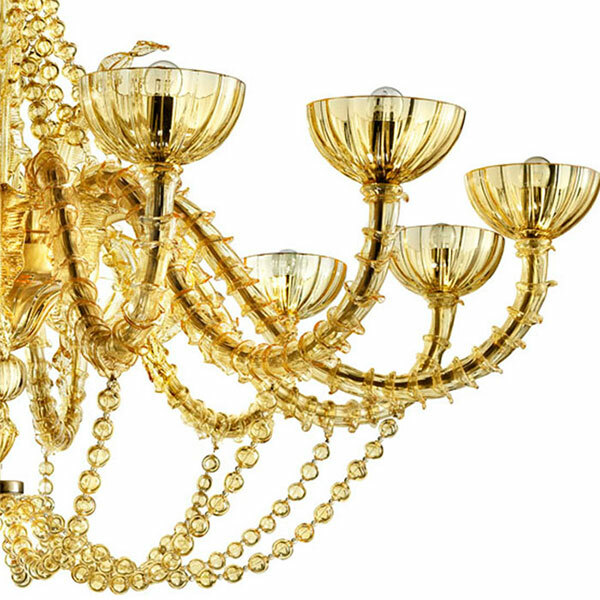 All 24K gold dust with color details (your choice). 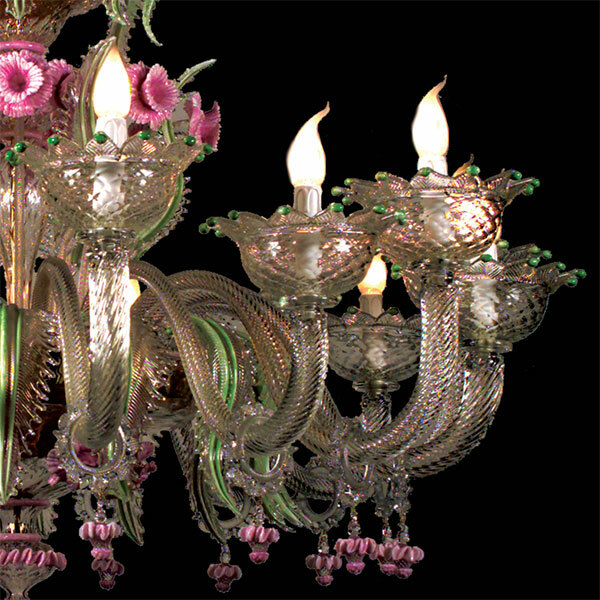 All 24K gold dust with details in green and pink flowers (torseo). 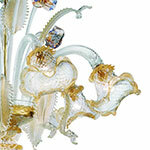 Transparent (crystal) with polychrome and gold details. 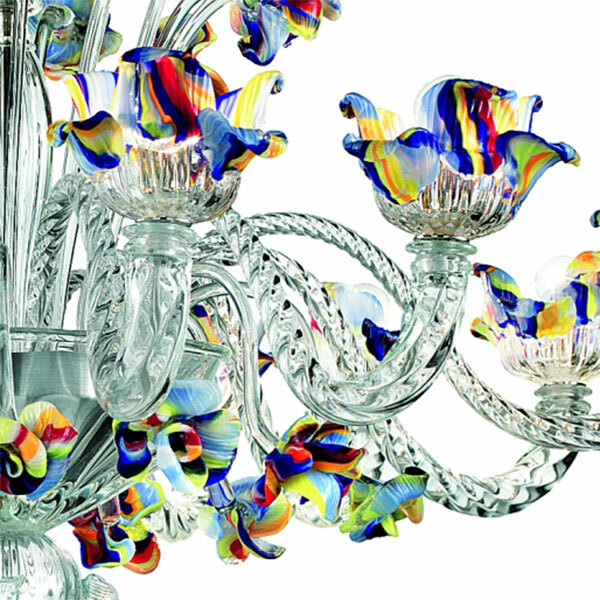 Glass in white silk and colorful details (polychrome). 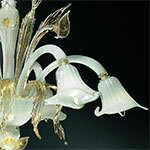 White glass with gold details in transparent glass (crystal). Transparent glass (crystal) gold with green details. 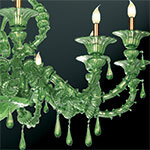 Green glass "acid" with 24K gold dust and pink paste. 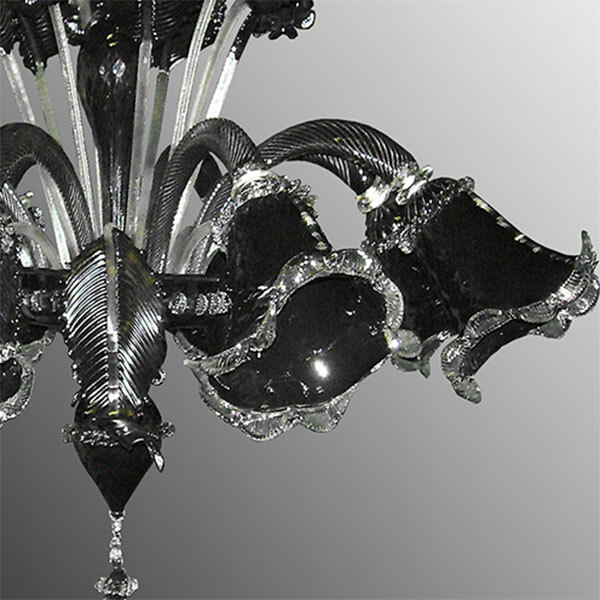 All black with details in transparent glass (crystal): leaves, flowers, pendants (if any) and "morise" (edges of the cups and the central body). 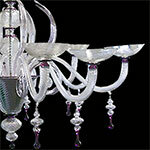 All white with amethyst details. 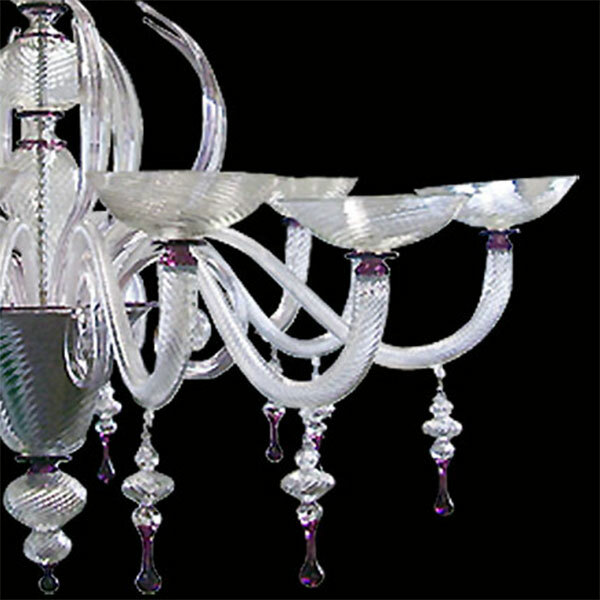 Transparent glass (crystal) with amethyst details. 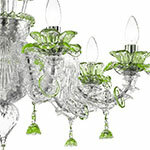 Transparent glass with silver inside, green and pink details.